How I learned that reading and studying the Catechism, Church doctrine and dogma, and theology are not ultimately about knowing things or facts but about knowing the living Christ. In the early 1990s, as a young graphic designer and artist-wannabe living in Portland, Oregon, I began to encounter—more and more often and in ever confounding ways—things and thoughts Catholic in nature. Looking back, it’s as if I repeatedly was going down mysterious trails that kept leading me to the Catholic Church. My love for the writings of T.S. Eliot, Gerard Manley Hopkins, and Flannery O’Connor, for instance, increasingly challenged me to think more deeply about the Incarnation and a sacramental understanding of reality. Reading Herbert Schlossberg’s fascinating Idols for Destruction: The Conflict of Christian Faith and American Culture pushed me to start reading Chesterton in earnest; I zipped through The Man Who Was Thursday, Orthodoxy, and The Everlasting Man in short order. Reading Chesterton marked a momentous turning point, without doubt, for doing so teased forth the flame of joy and mystery about faith and orthodoxy that had been slowly building during my time at Bible college. Other moments stand out: An out-of-the-blue phone call from a former Bible college classmate (now an atheist philosopher) introduced me to Walker Percy, whose fiction and non-fiction alike put me on my heels and had me seeing modernity in a new light. Somewhere along the way I stumbled upon Russell Kirk. And then there were the early Church Fathers, Augustine, Aquinas, Newman, Thomas Howard, Peter Kreeft, and many others. I vividly recall standing in a bookstore in Portland reading the letters of St. Ignatius of Antioch and realizing—it sounds quite funny now—that whatever the Apostolic Fathers were, they certainly weren’t Fundamentalists, Evangelicals, or Protestants of any sort. St. Ignatius’ condemnation of the Docetists for their refusal to confess “the Eucharist to be the flesh of our Saviour Jesus Christ” was especially riveting; I recognized the implicit gnosticism of my Fundamentalist upbringing, which was both anti-sacramental and anti-“Romanist”. “Which are you?” I asked. I retrieved Karl Keating’s book and we spoke for a couple of moments. He then asked, “Do you have a copy of the new Catechism?” No, I did not. He took one off the shelf and handed it to me. While I probably bought a few more books that day, those two stand out. As I told Karl years later, his book saved me a lot of time and came in handy when I eventually got into conversations and, yes, arguments, with friends and family members. The Catechism, however, would have an even more profound effect. As an Evangelical, I didn’t know where to start when it came to studying Catholic dogma and doctrine, practice and spirituality. 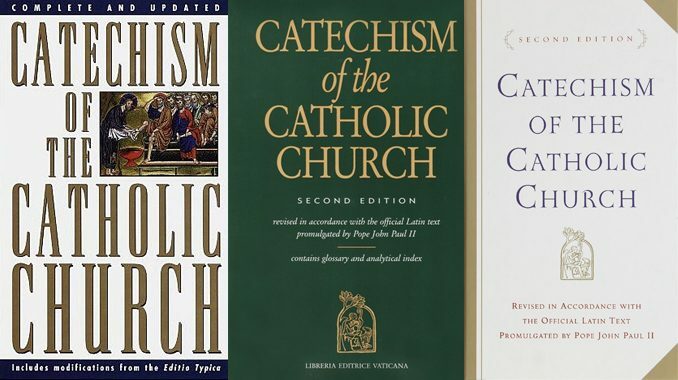 The Catechism, which was given to the Church on October 11, 1992, by St. Pope John Paul II (and had just been published in the spring of 1995 in English by Doubleday/Image), was an invaluable single volume—not just because it was one book, but because the structure, approach, and footnotes opened door after door, leading further and deeper into the strange and wonderful mystery called “Catholicism”. Over the years I’ve met many former Protestants (and certainly a few former agnostics and atheists) who credit the Catechism for helping them on the way to entering the Church. Several of them—some of them now close friends—have simply said, “I read the Catechism from cover to cover, and I was ready to enter the Church.” After I purchased it, I began looking up specific topics: Mary, the Eucharist, Church authority, and salvation. Time after time, the citations would lead to documents that I also read; it was like “Choose Your Own Adventure” in Catholic theology and spirituality, but always with the same focus and ending: the divine life of the Triune God. The quotes, as strange as they might sound to some Catholics, are from St. Irenaeus, St. Athanasius, and St. Thomas Aquinas (I eventually chose the latter to be my patron saint when my wife and I entered the Church in 1997). And this topic of partaking in the divine nature—called theosis in the Eastern churches—intrigued me so much that I ended up co-editing (with the wonderful Fr. David Vincent Meconi, S.J.) an entire book on the topic, contributing chapters on the New Testament and—you guessed it—the theme of deification in the Catechism of the Catholic Church. I would be remiss if I didn’t also note, with deep appreciation, the wisdom and teaching prowess of Dr. Mark Lowery, whose Fundamental Theology course in my MTS program was a deep and challenging study of the Catechism. Dr. Lowery, a man of tremendous intellect and holiness (and fabulous humor), showed time and time again that reading and studying the Catechism, Church doctrine and dogma, and theology are not ultimately about knowing things or facts but about knowing the living Christ, the Incarnate Word, the Redeemer and Savior. True theology is an act of worship and prayer; far from being dry or dull (or rigid! ), it is an encounter with the Triune God, who creates, draws close, calls, loves, and invites. The Catechism is a tremendous gift that contemplates, explains, and shares the greatest Gift of all. I liked reading that but don’t surrender to this Pope the evangelical’s love of all…all scripture…which is Thomist really. Dei Verbum of Vatican II states that the Magisterium is “not above the Word of God but serves it” (DV2/10)….” teaching only what has been handed on” ibid. Cardinal Newman said that real developments in the Church are not abrupt. The last three Popes violated both those sources in the death penalty issue which must be the largest stain in the catechism…and will help get countless largely poor people killed by murder wherever it influences going forward especially in the less developed world. Nonsense. 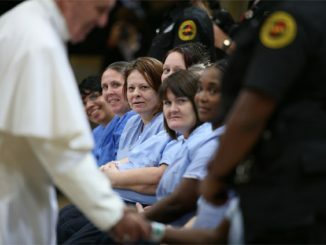 Very few states have abolished the death penalty because of what the Pope said about the death penalty. Now, secularists hate it with a passion, and they had far more effect than the Pope. Plus the Supreme Court banned the death penalty altogether back in the sixties or seventies for a while. That was long before the Popes spoke on the matter. Did you even read the words “wherever it influences” and “less developed world”. I made no mention of any states in the US. Lol…the US Supreme Court halted the death penalty in 1972 to study competing deterrence studies and after four years in 1976 concluded that the death penalty saves lives not as to spousal/passion murders but as to criminal murders as in muggings, armed robbery, loansharking, drug fights etc. It saves lives…as in…pro lfe etc. The Popes seem to have not done any research at all….when in humility they could have asked the US Supreme Court if they could examine their four years of deterrence work. Try to read and think prior to posting. One case in particular that repudiates the papal assertions about the death penalty is the case of Clarence Ray Allen. He arranged for hits on people from his jail cell. I’m not a big fan of the death penalty because of the possibility of wrongful convictions where no restitution is possible after the sentence is carried out, but there are some cases like the Allen one where it takes a willing suspension of disbelief to oppose the death penalty. Back in the mists of time when I was a young man I sought Catholic answers from Fathers Rumble and Carty. Aeons later Aquinas. I never put much stock in catechisms. When John Paul II’s Catechism came out I purchased it then found a spot in a bookcase with other books doomed to “someday I’ll read it”. Until someone challenged me on a Catholic website regarding my understanding of culpability for grave sin. I had quoted Aquinas on false conscience and responsibility. Aquinas states we remain culpable for something we should have known, Pius IX stated Invincible Ignorance refers to what is beyond our means to know. The protester quoted the Catechism where he said it gives the conditions for culpability one being “Absolute” knowledge of grave matter. My response was “There are some who are quick to draw their ultimate weapon when challenged. The Catholic Catechism”. I thought what distinguishes knowledge from absolute knowledge? I looked it up and found 1859 “Mortal sin requires full knowledge and complete consent”. Full knowledge seems more reasonable than absolute, because “full knowledge” can mean sufficient knowledge to be culpable. When we form a false conscience we begin by diluting what the intellect initially apprehends. Unless someone can provide a better understanding. At any rate it got me started and I’ve been reading and quoting the Catechism since. The Catechism is immensely important for a largely very poorly educated Laity and I consistently recommend its purchase and reading to parishioners. It’s a goldmine of knowledge of the Faith. … and lest we’re quick to forget or dismiss … “a goldmine of” scriptures! True – and sad – that, re: “a largely very poorly educated Laity”. In fact, throw The Catechism of the Catholic Church on them, and they go, Don’t judge me. Or, really, that’s what the Catholic Church officially believes? Or, let me see that; where does it say that. I love it. It’s my bond with Catholics, truth be told. I remember watcing Mother Angelica going on and on about what a great thing the Catechism was in 1992. At the time, I thought she was going a bit overboard. But now I understand that the Catechism is absolutely fundamental. We now have a handy reference work to consult as to what the church actually teaches. I have to wonder how people could have stayed Catholic at all before it existed. There would have been no where to go to get an authoritative explanation of church teaching. Maybe to a priest, but back then, so many were so screwed up, and taught things that were not true. It seems to me that part 4 of the CCC is neglected and underappreciated. I would like to add to samton909’s comments. I think, in general terms, that’s a correct take: the years from, say, 1967 to the early 1990s were very lean overall in terms of catechesis. The CCC came out of the 1985 Extraordinary Synod, which marked the 20th anniversary of the conclusion of Vatican II. My additional take is this: the Church, for various reasons (many of them quite sensible and good), has always moved slowly. But the changes that took place in the West between the late 1950s and late 1970s, were violent, quick, often irrational, and continual. It was the perfect storm, and the failure of many Catholic (both bishops and laity) to stand firm had devastating consequences. It seems the suggestion here is that a doctrinal vacuum existed from the close of the Council until the publication of the Catechism in 1992. In fact, there were multiple doctrinal publications during that period, most notably, the Creed of the People of God (1968); several papal encyclicals and apostolic exhortations, the General Catechetical Directory, and a number of substantive documents from the Congregation for the Doctrine of Faith. The Catechism of the Catholic Church was proposed as a comprehensive and clear depository of the whole doctrine of faith at the close of the second Christian millennium. It was much needed. But the poverty of catechesis during the interim from 1965 to 1992 was more attributable to a lack of pastoral will to announce the gospel and catechize than the absence of doctrine. I have only recently come to realize how much the progressives hated the idea of a Catechism and opposed it tooth and nail. For them, it represented a huge setback. 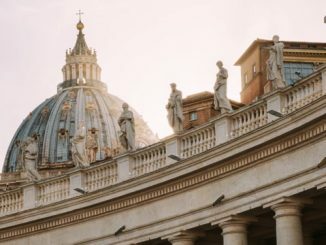 They were very happy with the theological free-for-all that had been underway since the Council and loudly protested that a new Catechism, by its very nature, was opposed to the “Spirit of the Council” because there could be no such thing as a universal faith, applicable to all Catholics everywhere. Thanks be to God for St. John Paul II and Benedict XVI (then Cardinal Ratzinger). Even now, however, you can see that many very highly placed Catholic clergy do not believe what is in the Catechism and oppose it. 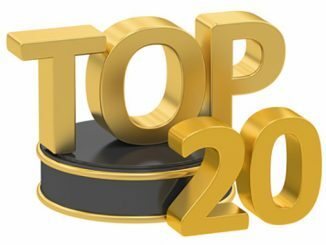 Several examples are Pope Francis attempt to overturn the teaching in divorce, remarriage and communion, the call of many bishops to abandon just war theory in favor of a “rigid” pacifism, and Pope Francis’ rejection of what the Catechism teaches about the death penalty (just yesterday). Ignatius Press published two books in the 1990s about the hatred for the CCC and related matters: Flawed Expectations: The Reception of the Catechism of the Catholic Church (1996) by Kenneth D. Whitehead and Michael J. Wrenn; and Catechisms and Controversies: Religious Education in the Postconciliar Years (1991) by Michael J. Wrenn. They are worth tracking down. Also good is Ratzinger’s “Gospel, Catechesis, Catechism”! It was a brilliant idea to begin the Catechism of the Catholic Church with the word “God” rather than the expression “Notwithstanding certain arguments to the contrary…”. Is the Catechism going to be revised? Pope Francis Wed Oct 12 spoke of the need to revise the Catechism on the death penalty. The entire comment however suggests further, far reaching revision to the Catholic Catechism, “The development of Church teaching, Pope Francis insisted, is not the same as contradicting or changing Church teaching. ‘Tradition is a living reality and only a partial vision would lead to thinking of ‘the deposit of faith’ as something static. The word of God,’ he said, ‘cannot be saved in mothballs as if it were an old blanket to protect against insects'”. The Deposit is the truth of our faith. Then what is Truth? Aquinas: “True [a judgment of the intellect] is interchangeable with being” (De Veritate 2 Ad 1). Augustine: “The true is that which is” (Soliloquies II 5 PL 32). Christ said “I Am the Truth”. What is revealed by Christ the Way the Truth and the Life is perfect and permanent. If the office of the Roman Pontiff is the mandate to defend preserve verify what Christ revealed, then what is Pope Francis? His brand new revision will guarantee that China even in the eyes of God will have a right to silence the Catholic Church on the death penalty…since it doesn’t want to become Brazil or Mexico….both non death penalty and with murder rates over 30 times China’s. Me? I’m a 7-year student now of The Catechism of the Catholic Church (CCC) because of its pages at the bottom footnoting bible verses. Many “an Evangelical … of [a] Fundamentalist upbringing” in my past had instilled in me a devotion to the gospels, epistles and revelation – plus an instant instinct to look them up every time they’re cited in publications. CCC is no exception to that rule or habit. (1) That as The Catechism’s “structure, approach, and footnotes opened door after door” for you, the bible’s own were being closed “door after door”? (2) That you “read the Catechism from cover to cover” but forgot or rejected whatever the gospels, epistles and revelation must’ve taught you on the very same subject or doctrine or point “cover[ed]”? (3) That you treated yourself to a “‘Choose Your Own Adventure’ in Catholic theology and spirituality”, as if to say that you had never found, let alone experienced, any such “Adventure” at any time during your “Evangelical … Fundamentalist upbringing”? The Catechism of the Catholic Church is masterpiece of Christian theology, mysticism, spirituality and devotion and will take its place alongside such literary wonders as the Imitation of Christ, the Confessions of St. Augustine, the Summa Theologica, St. John of the Cross’s Ascent of Mount Carmel, etc. If any religious book was ever inspired by the Holy Spirit, this is it.